Air Force Academy, Hyderabad (Pre-Flying) Training Course commencing in January, 2020 i.e. No. 207 F(P) Course. Degree of a recognised University (with Physics and Mathematics at 10 plus 2 level) or Bachelor of Engineering. Unmarried male candidates born not earlier than 2nd January, 1996 and not later than 1st January, 2001 only are eligible. Unmarried male candidates born not earlier than 2 nd January, 1996 and not later than 1st January, 2001 only are eligible. 20 to 24 years as on 1st January, 2020 i.e. born not earlier than 2nd January, 1996 and not later than 1st January, 2000 (Upper age limit for candidates holding valid and current Commercial Pilot Licence issued by DGCA (India) is relaxable upto 26 yrs. i.e. born not earlier than 2nd January, 1994 and not later than 1st January, 2000) only are eligible. unmarried male candidates born not earlier than 2nd January, 1995 and not later than 1st January, 2001 only are eligible. Click the FACEBOOK ICON below To get Alerts of All Job Notifications from WAY2TNPSC Interested and Eligible Candidates can apply before 26-Nov-18. Keep on reading this page to know all the above details. So, it will be helpful to know the procedure and details for the candidates who wish to apply for this particular vacancies. 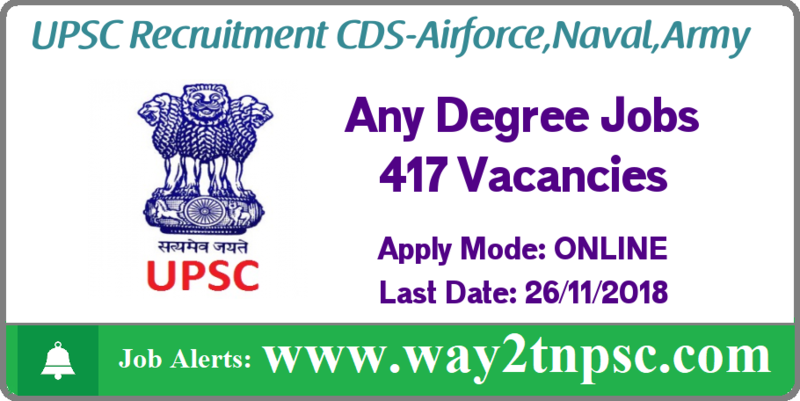 The above Notification ( UPSC Recruitment 2018 for 417 CDS I - Airforce, Naval, Army Posts | Apply online ) briefly describes about the details of latest announcement or notification includes important dates like release date , last date of application submission, details regarding fees, exam timings. Candidates, check all the needs and apply accordingly.